It’s a starry-eyed autumn night, one of those rare moments where life feels rich and full of possibilities, I’m listening to Rural Alberta Advantage by the hissing fire. RAA are a band who for a while now I’ve been absolutely taken with their mix of lonely love songs dashed with if not roaring, at least rolling, guitars. But I’m not going to write about them. 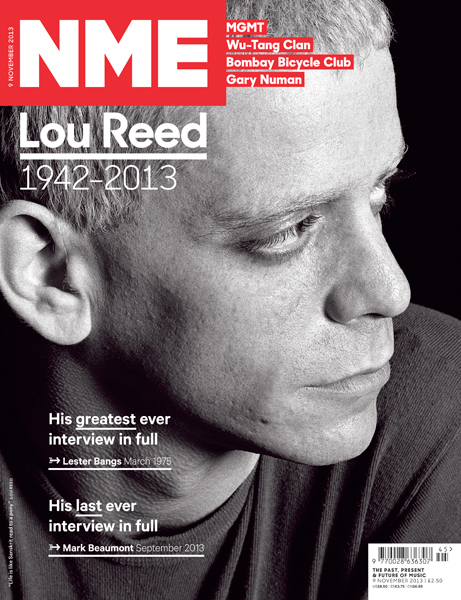 Instead it’s time to talk about Lou Reed. He may not have been a particularly nice guy, and we can’t blame him for all those awful bands formed by kids getting their minds blown on the velvet underground records, but he was Lou Reed, and for a while back there I couldn’t get Transformer off my record player. I first heard about the Velvet Underground through a free cd from a music newspaper called Melody Maker. I was 17, and my music world was rapidly expanding and I was always looking for something fresh, something exciting, and something fun and I usually found such things on Saturday afternoons at the record shop in Bury St Edmunds (a place I hated, which somehow made Andy’s Records all the more exciting). Anyway this free cd didn’t actually have Velvet Underground on, but had a really beautiful song by a band called the Modern Lovers called “Hospital”. This song was about the singer visiting his girlfriend in hospital after she’d taken a drug overdose, and the song completely knocked me out. All I knew about this band was the few lines written on the cd case that they were “highly influenced by Lou Reed and the Velvet Underground”. I had no idea who Lou Reed and the Velvet Underground were, but i was excited to find out. A few months later I found Lou Reed’s transformer in a charity shop, and I was even more excited to see that David Bowie – a guy I’d also recently discovered (I think through the guy from Blur raving about) produced it. I’d never heard anything like that before, it was playful, silly, but unbearably tragic and somehow pure. I never went through a whole Lou Reed period, (apart from listening to Transformer feeling tired and bewildered after parties) perhaps he made some brilliant records, i don’t know. At university boring hipsters got me high listening to the velvet underground and all that, and I never quite got it. I don’t know why, perhaps I was getting tired of hipsters already at 18. It wasn’t my scene, it was too druggy. Anyway the reason I wanted to mention Lou Reed at all is that he’s the cover star in this week’s NME there’s a really spectacular interview with him from 1975. in this interview the famous (and kind of strange) journalist Lester Bangs went to war with a drugged up and aggressive Lou Reed, it’s quite extraordinary to read and I’d really recommend you get a copy of the magazine or download it online. I’m not going to play Lou Reed now. Instead let’s go back to that Modern Lovers song I was telling you earlier. You might need to get the tissue box out though for this.